TLC match added to the pay-per-view, a look at the WWE UK story, charges dropped against Joey Mercury, Total Bellas returns, Conor McGregor banned from driving & more. **We have today’s edition of Rewind-A-SmackDown up on the site with Wai Ting and I reviewing Tuesday’s show in Minneapolis, the battle royal to set up a three-way TLC match, Jeff Hardy’s anniversary segment and the direction they are going with Samoa Joe, Randy Orton’s follow up attack on Rey Mysterio and how many false challenges they could feature in one show. Plus, we discussed CM Punk’s interview with MMA Fighting, Dana White’s reaction to the Chuck Liddell fight and his attitude toward Oscar De La Hoya, Impact Wrestling pulling LAX from the EVOLVE cards, and taking your feedback. **We also have the Double Shot out for members of the POST Wrestling Café with a packed edition chatting the WWE Network’s presentation of Starrcade on Sunday, the season two premiere of the Edge & Christian Show, the exorcism edition of Being the Elite, a pair of UFC documentaries on Ronda Rousey and Daniel Cormier, Ring of Honor and Lightning 1’s new series The Pinnacle, and Wai reviews the Katsuyori Shibata California Dreamin’ series on the L.A. Dojo. This show drops each Tuesday night with bonus reviews of additional content that Wai and I have watched over the past week. **Later today, we will have a big edition of the British Wrestling Experience coming out with Martin Bushby and Benno welcoming Fighting Spirit Magazine’s Will Cooling to discuss all the big moves in the UK this week and discussing it from all angles. **On Thursday, we have the Café Hangout live at 3 pm Eastern for Double Double, Iced Capp & Espresso members of the POST Wrestling Café. We will be unveiling all the categories for our year-end “Best of” and “Worst of” shows and also chatting with Jan Murphy of Postmedia about his feature on TJ Wilson and charity event in Kingston, Ontario this Saturday. 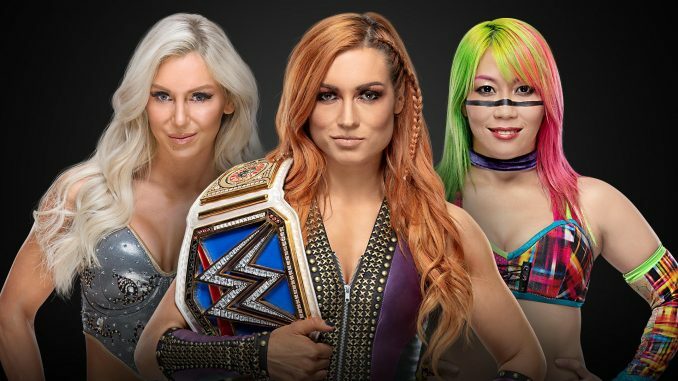 **A three-way TLC match for the SmackDown women’s title was set up on Tuesday night’s program with Becky Lynch defending the title against Charlotte Flair and Asuka. It’s the second TLC match announced for the December 16th card along with Braun Strowman and Baron Corbin, although Strowman’s status for the show isn’t known following elbow surgery on Monday in Birmingham, Alabama. **This week’s major story continues to be the landscape of the U.K. wrestling scene moving forward. From my vantage point, there appear to be extreme reactions in both directions with some feeling it’s the death knell and others greatly downplaying the moves being made by the WWE. History is a great indicator and if your reference point is their expansion in 1984 then there is a reason for alarm. I’ve seen a lot of criticism regarding the NXT UK talent and that’s unfair if you understand the story, I doubt you begrudge these performers for increasing their salaries and taking a perceived step forward in their careers. The concern is how viable outside promotions are with the loss of star talent and what kind of ecosystem they will exist in to create new ones and have a following at the level to sustain an independent. A big element to this story is the restrictions the NXT UK talent has when working for promotions with WWE affiliation (Progress, ICW, wXw etc). If those promoters cannot stream their matches, it’s a big blow to those groups and restricts the desire to book someone when they cannot stream their match and in theory, those NXT UK performers will lose dates. The other question is how much the salary increases equate to and if the potential loss of outside dates is mitigated by the new amount they are earning. Restricting partner promotions from streaming matches with their talent would be the opposite philosophy they just installed with EVOLVE, lifting the blackout ban and allowing NXT talent to work their shows and be streamed on the WWN Live platform. There will always be bodies ready to step up and assume larger roles in companies, but talent doesn’t always equate to drawing power and the WWE increasing their footprint onto the UK scene doesn’t come with an increased amount of time fans have to attend all the shows or have a bottomless amount of income to spend on every product. It is basic business that if the supply side is too high, the demand will not keep up and decisions will be made with some promotions left out to dry and unable to run a sustainable business if the WWE locks up talent and increases touring. **We want to send our condolences to Adam Copeland, who announced that his mother Judy passed away Tuesday. If you have read Copeland’s 2004 book, heard his Hall of Fame speech in 2011 or countless interviews where he brought her up, you would know close he was with his mother and how supportive she was of his wrestling career. Copeland has told the story many times that she was a single mother and made an incredible sacrifice to help Adam throughout his career. He always made a point to make mention of her in interviews and throughout his career. **The WWE Network is airing back-to-back episodes of NXT UK today at 3 and 4 pm Eastern. The first show features Pete Dunne and Jordan Devlin in the main event and the second episode has Toni Storm against Rhea Ripley to crown the first NXT UK women’s champion. **E! has announced that Total Bellas will return for their fourth season on Sunday, January 13th at 9 pm Eastern. News of the return was first reported by Mike Johnson at PWinsider on Tuesday. In the press release issued by the network, there was no mention made of John Cena being involved and only focused on The Bella Twins and Daniel Bryan. **The season finale of Total Divas airs tonight at 9 pm and will focus on the passing on Jim Neidhart this past summer. **MLW has announced Dragon Lee and DJZ will be part of the December 13th and 14th television tapings in Miami, Florida. Dragon Lee was scheduled to come in for the group in 2019 but due to several changes to this card, they sped up his debut for the December shows. They have also announced a Singapore Cane match between Tommy Dreamer and Brian Pillman Jr. for the December 14th show. Both shows take place from the Scottish Rite Temple in Miami and are being taped for beIN Sports. **KSDK out of St. Louis reports that the city will be one of the eight franchises that will be part of the XFL’s resurrection in 2020. Frank Cusumano, the sports director at the station, reports that the St. Louis franchise will play at the Dome at America’s Center and that the additional cities will be announced next week. The season will feature a 10-game regular season and will launch one year after the Alliance of American Football, which is being run by Charlie Ebersol. **PWinsider is reporting that several charges were dropped against Joey Mercury (Adam Birch) regarding the use of stolen credit cards. Mercury was arrested over All In weekend where he was working as an agent for the show and taken into custody regarding an outstanding warrant. His attorney released a statement slamming the Winter Park, Florida authorities and stated that a videotape revealed that it was not Birch who committed the crime and that his client wasn’t even in the country when the crimes were committed. The attorney also stated his client suffered irreparable harm to his reputation and was subjected to inhumane treatment while incarcerated in Chicago when he was taken in. **Three Democratic U.S. Senators are introducing legislation calling for a report on the murder of Jamal Khashoggi in October. Senators Ron Wyden of Oregon, Martin Heinrich of New Mexico, and Jack Reed of Rhode Island are introducing a bill that calls for the Director of National Intelligence to submit a report to Congress on the findings of Khashoggi’s murder on October 2nd inside of a Saudi Arabia consulate in Istanbul, Turkey. **Last week, I wrote about the pay-per-view experiment involving Tiger Woods and Phil Mickelson with the two having a golf match. Several days removed, there are several takeaways but I’m confident this is going to be attempted again. The streaming element was a disaster with Bleacher Report forced to stream the match for free due to an inability to process all the credit card information of the new sign-ups. Bleacher Report was hopeful of 150,000 buys but ended up with 750,000 viewers, although the latter figure was the free stream. The free streaming option forced cable providers to also offer refunds and must have been infuriating that they had to refund based off no fault of their own. However, beyond the streaming problems, if they have the right attraction to promote it tells me this can work and will at least be attempted again. Cable providers are in dire need of more content that audiences will pay for and there is no better example than the sweetheart deal the UFC was able to cut with them for their revenue split. Bleacher Report has even more to gain because they don’t have to split their revenue with the pay-per-view providers and their piece of the pie is far greater, just as UFC makes more off a digital buy online for a pay-per-view than with the cable providers. **UFC strawweight Rachael Ostovich is going to fight Paige VanZant on January 19th after the fight was initially canceled. Ostovich suffered a broken orbital bone allegedly being attacked by her husband, Arnold Berdon, who has since been charged and recently pleaded not guilty to the charges. Initially, Ostovich’s management announced she was off the fight with VanZant, but they informed ESPN’s Brett Okamoto that she received a second opinion on the injury and will be fighting on the card in Brooklyn, New York in January. **Conor McGregor has been banned from driving for a six-month period after he was charged with a speeding infraction in October 2017. RTE in Ireland reports that the UFC fighter was fined $1,128.09 (U.S.) after McGregor pled guilty to breaking the 100 kph speed limit last year. He also faced charges of driving without a license, failure to produce a license at the scene and failing to produce one at the police station. **The UFC officially announced that Henry Cejudo will defend the flyweight title against T.J. Dillashaw on Saturday, January 26th at the Honda Center in Anaheim, California in what could be the final flyweight title fight ever. This weekend will be insane as the UFC pay-per-view will be going up against a big Bellator card with Ryan Bader facing Fedor Emelianenko and the NXT TakeOver special over Royal Rumble weekend. **UFC featherweight Renato Moicano is not going to receive a replacement to fight on next weekend’s UFC 231 card in Toronto. Moicano was scheduled to fight Mirsad Bektic, who was injured and forced to withdraw from the fight on December 8th. Moicano will still go through all fight week preparations and serve as the alternate in case of an issue involving the main event title fight between Max Holloway and Brian Ortega. Moicano is 5-1 in the UFC and coming off wins over Calvin Kattar and Cub Swanson this year. **The California State Athletic Commission has reacted to Saturday’s fight involving Tito Ortiz and Chuck Liddell and opted to issue an indefinite medical suspension to Liddell. The decision by California would make it more difficult for Liddell to fight in the United States in a commissioned state that is likely to honor California’s suspension. The CSAC is regarded as one of the top commissions in the country but received a lot of criticism following Saturday’s fight and their decision to license the 48-year old. Obviously, this is going to come down to Liddell and those around him deciding if he wants to fight again but the immediate reaction inside the cage Saturday appeared to be Liddell realizing his days of fighting are over. Sadly, there will always be a commission or promoter that runs unregulated that would jump at the chance to promote a fight involving Liddell and if he wants to fight, he will find a promoter that will pay him. John Pollock and Wai Ting review the WWE Starrcade test, Edge & Christian’s season-premiere, Being the Elite & a pair of UFC documentaries on Ronda Rousey & Daniel Cormier, plus the New Japan World feature on the LA Dojo. The Target Center in Minneapolis was the site of SmackDown Live Tuesday with a Battle Royal to determine the third member of the first women’s TLC match next month involving Becky Lynch and Charlotte Flair, Randy Orton and Rey Mysterio continued their feud with another attack, and Jeff Hardy’s 20th anniversary celebration was ruined by Samoa Joe.